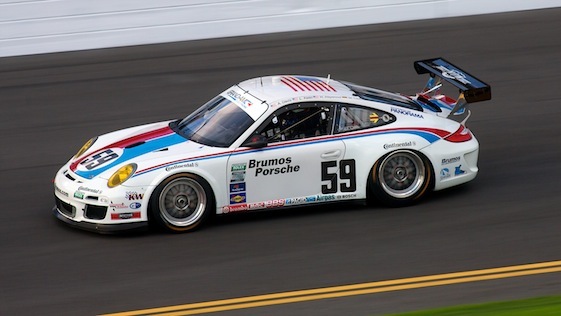 Hurley Haywood takes a lap at Daytona in the famed Brumos 911. It looks much like the car which Butzi Porsche designed 50 years ago. Somehow, we crammed four of us into the friend of a friend’s Porsche 911 as college students back in the early 1970s. I remember being so contorted that I couldn’t see much through the back “seat” windows of that sparkling white 911, and could, basically, hear very little other than the flat-six boxing away just inches to the rear. But I do remember seeing and hearing people screaming and gesturing at us to slow down as we tore through the tight, tree-lined streets of an upscale Madison, Wis. neighborhood. It was the first ride in what is still the greatest sport car in the world and what got me thinking about that day of 41 years ago, was news of the death this week of the man who designed the 911; Ferdinand Alexander “Butzi” Porsche. The grandson of Porsche founder Ferdinand Porsche, Butzi died in Austria at age 76. The Porsche marque was founded by grandad, who designed the Volkswagen “beetle” for the Nazi regime in Germany. After the war, Ferdinand Porsche was jailed for being a Nazi and an associate of Adolph Hitler. Defenders of Ferdinand Porsche insist that his association with Hitler and the Nazis was one of convenience – he needed their money to build his cars. With his father in prison after the war, son Ferdinand “Ferry” Porsche took over the business and designed and built the Porsche 356 – the sports car which fathered the 911. When his father, in failing health was finally released from prison, he saw the 356 up close for the first time. An engineer and demanding taskmaster, Ferdinand blessed the 956 project and the nervous Ferry breathed easy. It was Butzi, Ferry’s eldest son, who transformed the 956 into the 911 in the early 1960s. Today’s 911s have seen their original mission of being more about handling than high horsepower tweaked. And in the late 1990s, the engines – to the chagrin of many 911 purists – went from being air-cooled to water-cooled. But 911s remain true to the original formula of rear-engine, rear-drive horizontally opposed six-cylinder engines mounted to a relatively short-wheel-based chassis. Their appearance has been refined and rounded, but they are still the most identifiable cars on the road. And, the track. The 911s are still winning sports car races from Daytona to Le Mans. They are, in fact, the winningest marque in sports car racing. They still inspire very fiece loyalty among their owners. Porsche guys still hate Ferrari guys the way Ford guys used to hate Chevy guys in this country. The Stuttgart-based company has refused, over the years, to radically tamper with the formula. Jeremy Clarkson, one of the hosts of the BBC’s wonderful “Top Gear” – an auto writer who is quite adept at arguing issues with himself – said on the show that Porsche designers are the laziest people in the world because they have steadfastly clung to the original 911 look. Some of us, however, praise the company for not succumbing to other designers’ desire to change looks just to change looks. The philosophy of continually improving a design rather than scrapping it every year or two just for the shiny object types, looks reasonable and solid. And there is no arguing with the result. If you see 911s on the street the next couple of days and they don’t look quite right, it could be because a number of Porsche websites are calling for rear spoilers to be affixed to the half-mast position in honor of Butzi. And if you’re one of the people in Madison who feared for their lives four decades as a student-stuffed 911 blew past them in a vortex of dust, exhaust, autumn leaves and loud music from a Blaupunkt radio; sorry about that. Butzi made us do it. In reality, what any car is to live with day to day, in bad weather, blind crests, night driving, and poor roads at real speed is a true test of any sports car. Dynamically driving a car is much more feedback and experience than any car magazine can articulate to the reader. My 911 put its ‘hooks’ in me years ago, and I never get bored or tired of driving it. And I don’t hate Ferrari’s…happy for anyone that can get what they deserve through hard-work.